Volunteers are the key for success! La familia at La Casa would not be complete without the commitment of her incredible volunteers who freely give so much time! Los voluntarios son la llave para el exito! La Familia en La Casa Hogar no estaría completa sin el compromiso de su voluntarios wuienes libremente ofrecen mucho de su tiempo! Despues de ser voluntaria, comenze a trabajar formalment en la Casa Hogar en el 2003. Todos estos años he trabajado en diferentes areas como La Escuelita, cordinando eventos, Instructora de clases de computacion y Manejo; trabaje en el servicio de emergencias en La Casa 107. Los ultimos ocho años he trabajado en el programa de ciudadania como instructora, y tambien estoy certificada por el departamento de Justicia para llenar aplicaciones de ciudadania. “Lo que mas disfruto de mi trabajo en La Casa Hogar es ayudar a la gente, aquellos que necesitan ayuda y no tienen otro lugar a donde ir mas que en La Casa Hogar”. 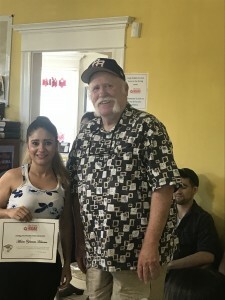 Yaneth attended Pre-GED classes at La Casa Hogar in winter 2017, and this September 13th Yanet received her GED Diploma. 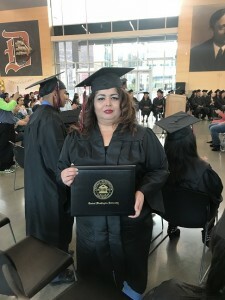 Thanks to AMERIGROUP for a grant awarded to La Casa’s Pre-GED program this 2018, your support gives La Casa more opportunity to help students like Yaneth when they need support to pass to the GED program. Thankful student returns to La Casa to share her amazing achievement! Recently Ofelia Gonzalez came to visit La Casa. 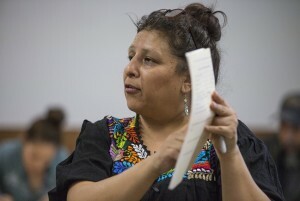 Ofelia is a former computer, English and pre-GED student. She was very happy and came to share about her recent work experience. At the beginning of the season, she applied to work in a warehouse, just for the cherry season. Her manager offered her the opportunity to do computer-related work. Even though she was nervous, she agreed because it is hard to say “no”. She was concerned about being unable to do the work. They gave her a week to learn. To everyone’s surprise, she learned the job in one day and had the position the whole cherry season! At the end of the season she was offered a year-round position doing the same computer-related work at the warehouse. Ofelia is very proud of her achievements. She came to let us know about her success and to say thank you for the support she received here at La Casa Hogar. Amazing indeed, Ofelia is one among many women whose lives are changed because of their participation at La Casa Hogar, and our community is also better for it. My name is Magdalena Serrano. I am married and have two daughters, 10 and 5 and a son, 8 years old. I would like to tell you a little about how I arrived at La Casa Hogar. I have lived in the Yakima Valley since 1991. The first 5 years were very difficult, even traumatic, for me. Recently married, expecting a child and in a new country, where unfortunately I was not able to express myself adequately, sometimes could result in a real trauma for me. But one fine day I met a good friend who told me about La Casa Hogar and the services that were there for the community. I was interested principally in English classes and had to have childcare for these classes. Here they accepted me as a student, but mainly they accepted me as a member of the family of La Casa Hogar. Little by little my depression disappeared until I began to feel like I had something to offer and that I could repay a little of what I had received. Now I am a volunteer and after work I go to La Casa Hogar to teach a driving class. Some of the women come with the necessity of learning in a group and with enthusiasm to make changes in their lives by getting a drivers’ license. At La Casa part of coming and learning is having an open door to friendship. If you need help and for some reason we are not able to help you, perhaps we can refer you to where you can get some help. If someone that you know or you think might be in a similar situation as I was, tell her, “Come to La Casa Hogar.” I assure you that here she will encounter what she needs. Try coming and you will not be sorry that you came. To me La Casa Hogar is like a visit to my beloved friend’s home, or the home of my loving aunt. Because here at La Casa Hogar, I have found affection, amiability and trust from the staff and sincere answers for all of my questions. Overall, it fills some part of my expectations as a woman and human being. Thanks Casa Hogar for opening your doors to whomever needs a sincere friend. God bless you forever. In my personal opinion; to me La Casa Hogar is an experience and at the same time a big opportunity to learn English like a second language. I hope that in the future we can count with more places like this to give more opportunity to more people. I want to say thank you to the institution and the staff. Because a friend of mine told me about this class and for this reason I came, because to learn and succeed. Thank you!! the place where I am today. It’s the wholeness I yearn for. open the path for those in between. Enedina, Mireya, Magdalena, Jim, Neli, Rosa, Luz and me. it’s the being of me, where it all comes together.